Rory Sutherland and his wife Cheynna welcomed their daughter Aurelia on March 13. Aurelia Sutherland joins big brother Eston. Rory is originally from Canberra, and has been racing competitively since the age of 14. 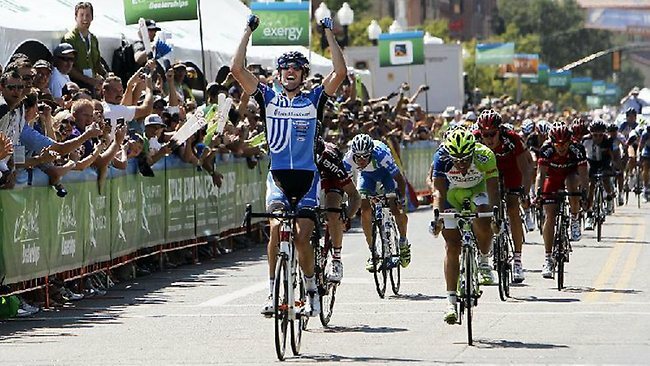 He has won many international races, and currently rides for Team Saxo-Tinkoff. At one point, Rory lived in Colorado in the United States, which is where he met his wife Cheynna. The family are now based in Girona, Spain. Although the name Aurelia is a little dated in Spain, here it is becoming very fashionable. Matt Wilson and his wife Meg welcomed their son Hugo on March 21. Matt was a member of the national team, and after surviving cancer took up professional cycling. He came first in the National Road Race Championships in 2004, and the Herald Sun Tour in 2007. He retired last year. I love Aurelia! And it seems quite topical at the moment — presenter Jake Humphrey just named his daughter Florence Aurelia Alice “Flo”. I love it too, and it seems so chic. I’m a bit sad she hasn’t been voted as “perfect”, while Hugo has.